A stylist and celebrity favorite, Stylin' Tape is a high quality double sided fashion and body tape. Three widths are a must for any daring style. Stylin' tape keeps your clothes where they belong- on you! Keeps deep v-necks secure, get a hold on strapless styles that won't stay up and no more sliding straps! Made from the finest grade medical adhesives on the market. Will not pucker, damage or leave residue on fabric. Adhesive stretches so it won't pop off. 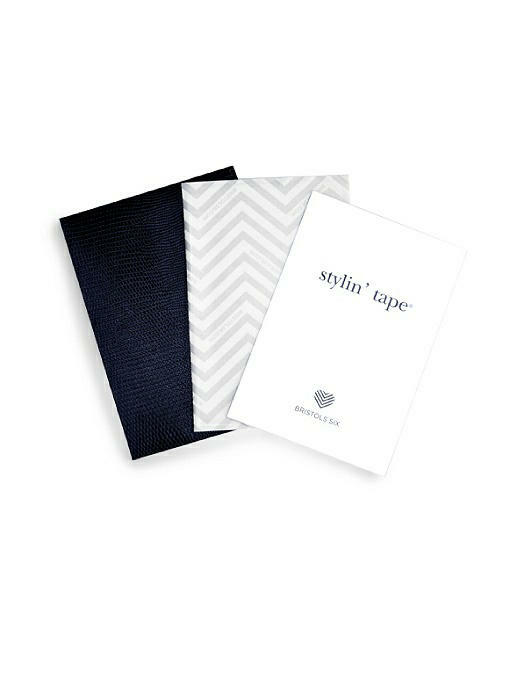 Stylish faux-snakeskin envelope keeps tape clean and protected in your handbag. Can wear for 6-8 hours. Each pack contains 32 pieces in 3 widths. 18 thin strips for lightweight fabrics. 10 medium strips to secure low necklines and slipping straps. 4 wide strips for better hold on strapless bras, tops and dresses. Dimensions: Thin strips = 1/4" x 3", Medium strips = 1/2" x 3", Wide strips=1" x 3". Item is non-returnable. Final sale.